Naneu makes high quality camera bags that double as backpacks. We reviewed the K3 last year and found one minor problem but the K4L has addressed the issue and I believe it’s one of the best camera/laptop bags I’ve used. To test the bag we loaded it up with a DSLR and some lenses, clothes for two, and two heavy laptops. The bag kept everything well padded and once you hoisted it on your back it was quite comfortable to carry even though we had about forty pounds of stuff in there. The front opens up and features filter pockets while the bottom camera pocket can hold two separate cameras. There is a large central pocket, two side pockets for chargers and smaller devices, and a surprisingly large back laptop slot that fit two laptops. Best of all, the K4L is well strapped and padded for travel. This is not a “lug around town” backpack. It’s definitely a piece of luggage. 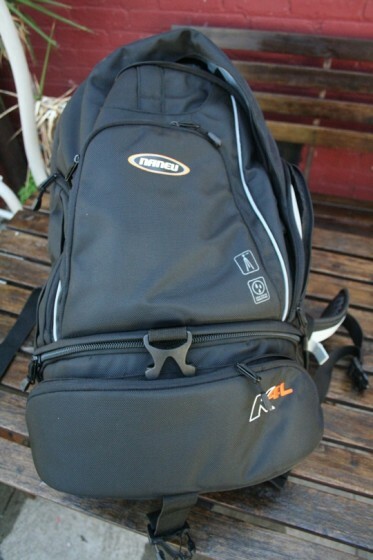 Any photographer could easily pack a few day’s clothing, two cameras, and a laptop in this with no problems. Best of all, it has a rain cover for rough situations. The K4L is launching right now for $199.99 and it comes in black and slate blue. This is a great bag with plenty of room for just about anything.